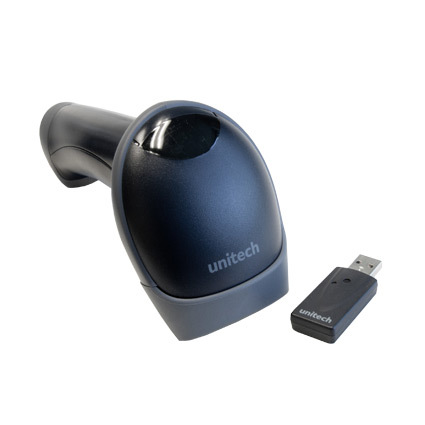 The Unitech MS840P wireless scanner provides the mobility and affordability you need for retail and light warehouse scanning. With fast laser scanning and unique radio communications, the MS840P is a great solution for a variety of uses. The MS840P uses a proprietary RF radio, giving you secure communications from up to 33 feet away, ideal for away-from-checkstand inventory checks or back office scanning. When out of range, the MS840P switches to batch mode automatically, storing scanned data until you can reconnect with the base station. 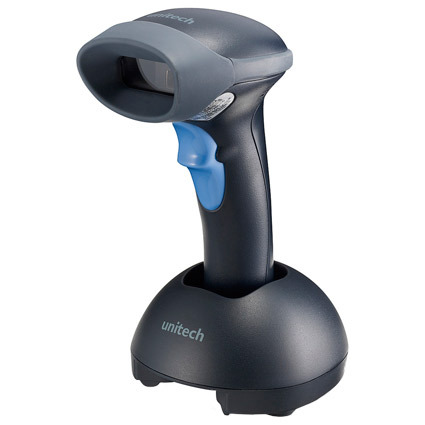 As a laser scanner, the MS840P offers the quick scanning needed for high volume retail and light industrial use. An optimal scan range of 1.5" to two feet for standard retail barcodes ensures employees get scans quickly and without any trouble. The MS840P´s 104 scans/sec scanning speed provides the fast, accurate data you need in high stakes scanning environments. Dimensions (W x D x H): 2.91" x 3.5" x 6.93"
4 Mil Code 39 0.98" to 5.47"
5 Mil UPC 1.25" to 8"
7.5 Mil Code 39 1.5" to 13"
10 Mil Code 39 1.5" to 18"
13 Mil Code 39 1.5" to 24"
15 Mil Code 39 1.5" to 28"
20 Mil Code 39 1.75" to 33"
40 Mil Code 39 * to 36"
55 Mil Code 39 * to 45"